Ok, comics geeks, pop quiz: What do the four heroes and the four villains each have in common? The answer is that none of the four heroes founded the corporations that bear their family names: Each of them inherited their wealth. In some cases the heroes bear substantial responsibility for the success of their companies, but in the case of Stark and Kord, this is primarily a function of their scientific and inventive genius, not their business acumen. All but Wayne have, for some portion of their history, faced financial difficulties as a result, either losing or surrendering control of their companies at least temporarily. For the supervillains, precisely the opposite is true. 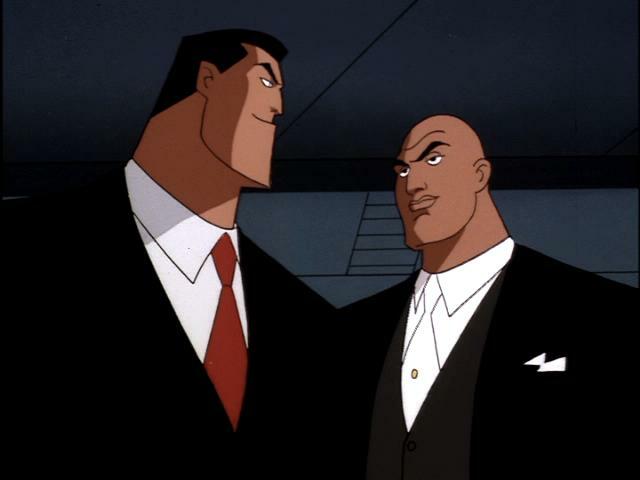 While the TV show Smallville and a handful of one-off comics depict Luthor as born to wealth, he has typically been portrayed as a child of abusive, impoverished parents who rose from the mean streets of Suicide Slum to found LexCorp. Fisk, too, grew up poor and bullied. Veidt describes his parents as an ordinary, unremarkable couple, and it’s implied that they are working or lower-middle class. [Update: As a commenter notes, I’m misremembering: Veidt’s parents were actually wealthy, but he chose to give away his inheritance to charity as a teenager in order to start from nothing.] Osborn’s father was an industrialist who raised Norman in relative luxury… but also an abusive alcoholic who lost the business and his fortune before Norman was college aged, requiring him to effectively start over from scratch. [Update: I could have added Stark’s bete noire Obadiah Stane—played by Jeff Bridges in the movie—whose “degenerate gambler” single father left him orphaned as a child thanks to a round of Russian roulette.] While Kingpin’s wealth comes almost entirely from his criminal operations, with the “legitimate business” of Fisk Enterprises serving primarily as a front, the others seem to have earned most of their wealth by more-or-less legal means. Now this ought to be at least somewhat surprising. Conventional wisdom, and the vast majority of popular film and fiction outside the superhero genre, suggest that the heroic characters—the ones we admire and identify with—ought to be the ones who earn success through their own merits after a long struggle, while the villains are snobbish children of undeserved privilege. When it comes to the most famous businessmen in comics, though, we find that just the reverse is the case! While on the surface, for instance, the rivalry between Luthor and Superman pits cosmopolitan, urban corporate wealth against humble American rural values, it has also often been stressed that Luthor resents Superman for simply being born with spectacular abilities that dwarf Luthor’s hard-won achievements. What might be going on here? While the pattern in comics inverts the meritocratic ideal that seems to rule in most modern American fiction, it fits quite naturally with a pre-capitalist aristocratic ethos, which persisted at least through the early 20th century in the form of Old Money’s contempt for the nouveau riche. Jane Jacobs, in her book Systems of Survival, contrasted this aristocratic view, which she dubbed the “Guardian” moral complex, with “bourgeois” or “mercantile” ethics. In this worldview, while wealth and the leisure time it affords may be necessary preconditions of cultivating certain noble qualities (whether that’s appreciation of classical art and literature, or the martial, deductive, and scientific skills of a masked crimefighter), the grubby business of acquiring money is inherently corrupting. The ideal noble needs to have wealth, while being too refined to be much concerned with becoming wealthy. It’s permissible for Stark and Kord to be largely responsible for the success of their companies because their contribution is essentially a side effect of their exercise of their intellectual virtues. Along similar lines, while the Fantastic Four have plainly become enormously wealthy from the income stream generated by Reed Richards’ many patents, I don’t recall many scenes in which we see Richards stepping out of the lab to apply his intelligence directly to their commercialization: His inventions are presumably sold or licensed to others who concern themselves with transforming Richards’ genius into cash. A similar pattern holds for literally noble or aristocratic power in comics. Princess Diana (Wonder Woman) and T’Challa (Black Panther) are hereditary royalty. Doctor Doom and Magneto are members of despised and oppressed minority groups (Doom is Roma; Magneto a Jewish mutant) who actively seize leadership of Latveria and Genosha, respectively. Democratic power doesn’t fare too much better: Lex Luthor was briefly president of the United States. The logic of this, as I apprehend it, is that the hero must wield enormous power in order to effectively perform the superheroic function, but cannot seem to seek it too eagerly, even for admirable ends—perhaps particularly when we consider that they typically make use of their great economic power by translating it into a superhuman capacity for physical violence. Spider-Man is always reminding us that “with great power comes great responsibility”—but the responsibility is the noblesse oblige of one who has (often reluctantly) found that power thrust upon him. Protagonists in ordinary popular fiction, like most of us most of the time, are allowed to seek their own happiness—and we’re allowed to share that happiness, through our identification with them—in line with ordinary bourgeois morality. But what makes superheroes “super” (and not merely heroic) is precisely their extraordinary capability to exercise coercive power and dominate others. In their case, bourgeois norms have to yield to the Guardian ethos—which, when their power is partly economic in origin, requires turning pop fiction’s ordinary meritocratic ideals on their head, at least in that limited domain. Alan Scott started out as a railway bridge builder, got into broadcasting, then broadcasting management, then broadcasting ownership, and seemed to be pretty big time. Rex Tyler was an underappreciated working-stiff chemist, in the golden age, but was recently retconned as having (mid-career) married into significant money. Stark and Wayne have a lot of parallels, probably enough to keep a stable of lawyers employed for decades yet to come, but the writers just seem to *love* to destroy Stark Enterprises, either by corporate takeover, or rampaging Super, or relative, or etc… All the way down to recently being so busted bankrupt he winds up conning a neighborhood into funding the re-opening of an abandoned factory to make pill bottles, and without a dime to his name. He really needs to call his company Phoenix, because it comes back from the ashes every time it burns. What a fun and thought provoking read… including the comments! Something to note: Both Marvel (pre-Disney) and DC are New York based companies, so the CEO as a villain thing doesn’t really surprise me. Gotta figure that there would be a few libs in the editorial mix. I’m not convinced this is a conscious decision on the part of the creators of the comics, as opposed to a genre necessity. People who make their own fortunes tend to be heavily involved in their businesses, until they reach a point at which they nearly run themselves. Their children come of age in a world where that’s already happened, which gives them a great deal more free time in their prime crime-fighting years. It’s true that villains’ businesses seem to have reached that point already… but I’d claim this is a necessity again because it’d make for a boring story if Lex Luthor wasn’t cleverer than Superman, or if Doctor Manhattan wasn’t able to be blinded by Veidt (implying (along with a lot of other explicit evidence) intelligence and drive vastly greater than that of the majority of people). In fact, it’d make for no story at all. The only hero for whom this is not true is Batman, but he’s the exception that proves the rule; Wayne does have to struggle enormously to become Batman (that’s not inherited or given), and there simply aren’t enough hours in the day to make it plausible that he could build a corporate empire to self-sufficiency and learn his crime-fighting skills, while still leaving room for him to be seriously challenged. Wait, didn’t Ozymandias inherit his wealth, then give it all away, go on a pilgrimage to learn about the world, then build an empire from scratch? Ozymandias: I was determined to measure my success against his [Alexander the Great]. Firstly, I gave away my inheritance to demonstrate the possibility of achieving anything , starting from nothing. Next I departed for Northern Turkey, to retrace my hero’s steps. So yeah, he doesn’t belong on this list. He’s just an evil CEO that built everything from the ground up. His inheritance doesn’t count. Wow! Not much love for the Incredibles! And a lot of misapprehension about Watchmen. Where to start? First: the entire setup of the Incredibles is a world that has rejected “supers” precisely because their powers make “normal” people uncomfortable. How “special” is running the 100m in sub 10, when “Mr 100” can do it in sub 1? The villain is not a “meritocrat” wanting to “give powers to everyone” — he’s a “super” fetishist sociopath, convincing himself his selfishness is “effective” or “right” because it will “prove” that his sociopathy is “normal”. Second: there is only one superhero in Watchmen, and that’s Dr Manhattan. The rest of them are mentally ill costume fetish vigilantes. Watchmen is *specifically* about the fact that even one actual factual superhero *changes the entire world*. It’s utterly ludicrous for “Superman” to limit his activities to “fighting crime” in one city — this is what Watchmen points out. And Dr Manhattan is _utterly alien_ and eventually takes himself out of the human world entirely. Likewise, Ozymandius is a _send up_ of the typical “inherit or self-make” comic-book CEO/villain/hero. He *consciously* both inherits and self makes. He’s consciously a hero-who-becomes-villain because the ends don’t justify the means. It’s a little silly to try and form every comic ever written to Julian’s otherwise excellent and interesting observations about some fairly widespread cliches and archetypes. In then heroes case I think a lot of the motivation is that they were oblivious to the world outside there aristocratic upbringing. Especially in the case of Bruce, Oliver, and Tony, they never thought of the underprivileged until something spurred them to think differently. To me that’s a huge part of their stories. Like in Batman Begins, Bruce has to give up the things that anchored him to that world in order to really be this avenger of the innocent and downtrodden. Stark had to see the true horrors of war and what it does to real people for him to see that he could do something more. And Oliver had to become as basic as a human can be to really reach his potential. I enjoy the knowledge you present here and can’t wait to take a loo when I get home. It’s not even just CEOs, but as a general rule, heroes come from privileged backgrounds – the Justice League has only two guys who aren’t supernaturally powerful aliens mythical royalty, or trust fund plutocrats. Meanwhile, villains are of much lesser lineage – Magneto is a Holocaust survivor, Doom is a gypsy, Sinestro was born on a world rife with crime and so on. Fittingly, the word “villain” itself originally meant “farmhand” and was used to denigrate upstart commoners… like the kind whose work built modern democracies. It’s not surprising then, that villains often become more popular than heroes. In a way, the logic of the article is unfortunately backwards. It wouldn’t be like this if it was in regard to any other type of story, but in comics, everything is backwards itself, so the article hits the wrong track for the right reason. Instead, it should be pointed out that comics usually start off with characters fully formed in their permanent conditions – hero or villain, rich or poor etc. – while anything beforehand is tacked on later, as a frequently changing backstory. It’s just that being born into wealth is an easy way to have heroic characters gain vast resources without drawbacks, while growing up in poverty is the favorite armchair psychology excuse for sociopathy and megalomaniacal ambition later on. At any rate, next to the various other unwholesome themes permeating superhero comics – the casual sexism, holdover racism, and the generally unflattering portrayal of humanity as hapless lemmings constantly in need of spandex-clad helpers – the attitude towards hereditary and self-made wealth is among the least of concerns to begin with. I’ve always seen the original Teen Titans that way. Of them, only Wally/Kid Flash comes from a simple middle class suburban family. Robin – Born in Circus, expert aerialist at 10, parents murders, taken in and raised by billionaire. Speedy – Parents die, raised in (somewhat sterotypical) Native America reservation, expert marksman at 10, taken in and raised by billionaire. Wonder Girl – Parents killed, rescued by Wonder Woman, raised on mystic island as daughter of the Queen. AquaLad – Prince of underwater city exiled as baby due to superstition. Saved and raised by king of bigger underwater city. Now that I think about it, the fulcrum of these people and the stories that star them isn’t wealth, but power. Essentially, in the aristocratic ethos, being an heir to power was the only proper way to receive it, while actually acquiring it on your own is a big no-no. Of course, this idea had to be propped by aristocrats listing all their ancestors down to biblical progenitors, instead of their true past as violent conquerors themselves. Consequently, superheroes build up on the idea that the only proper heroes are those born of powerful families, or adopted therein, or otherwise being granted powers by a beneficiary or sheer luck. Anyone amassing influence from the ground up is inevitably revealed as a villain, or a very shady anti-hero at best. Bottom line, superheroes feed on the outdated notion that only elite nobles deserve power, while individuals of lesser birth have no right to strive for it. This is probably why superhero comics don’t really appeal to the general public (among a slew of other creative problems), while superhero films focus more on the villains, them being the only characters that are actually interesting.